This is an advanced, research-oriented course on statistical natural language processing. Students and the instructors will work together to understand, implement, and extend state-of-the-art machine learning algorithms for information extraction, named entity extraction, co-reference resolution, and related natural language processing tasks. The course will involve two primary activities: reading and discussing current research papers in this area, and developing a novel approach to continuous learning for natural language processing. 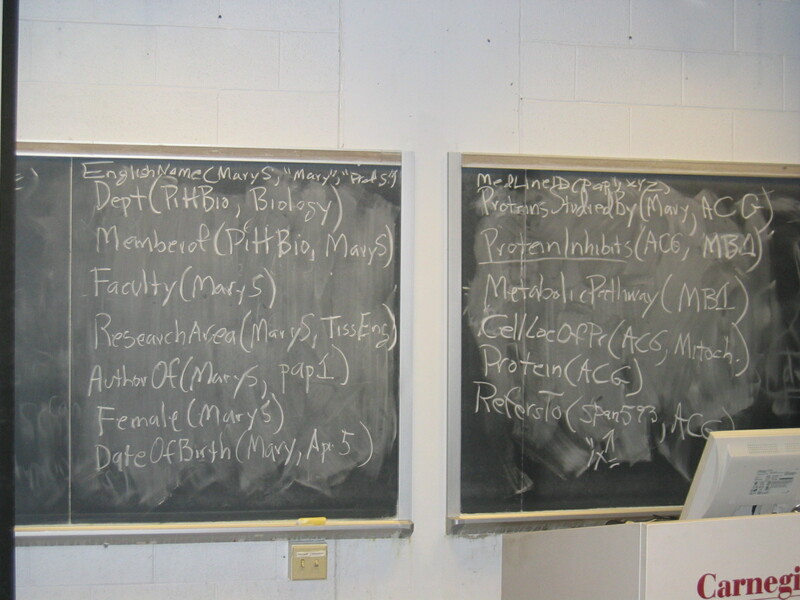 More specifically, as a class we will work together toward designing and building a computer system that runs 24 hours/day, 7 days/week, performing two tasks: (1) extracting factual content from unstructured and semi-structured web pages, and (2) continuously learning to improve its competence at information extraction. KIVA Discussion Site : we're using this site for discussions about specific projects, meeting scheduling, etc. Resources: a list of candidate resources (eg., search software, Wordnet) which may be useful in our system. Task List: To succeed as a group we'll have to accomplish a number of important tasks beyond individually learning the material and developing our individual component of the system. These tasks range from serving as a class consultant to help others use the Minorthird system, to helping manage the course website. Everybody is expected to sign up for something. Please sign up now. 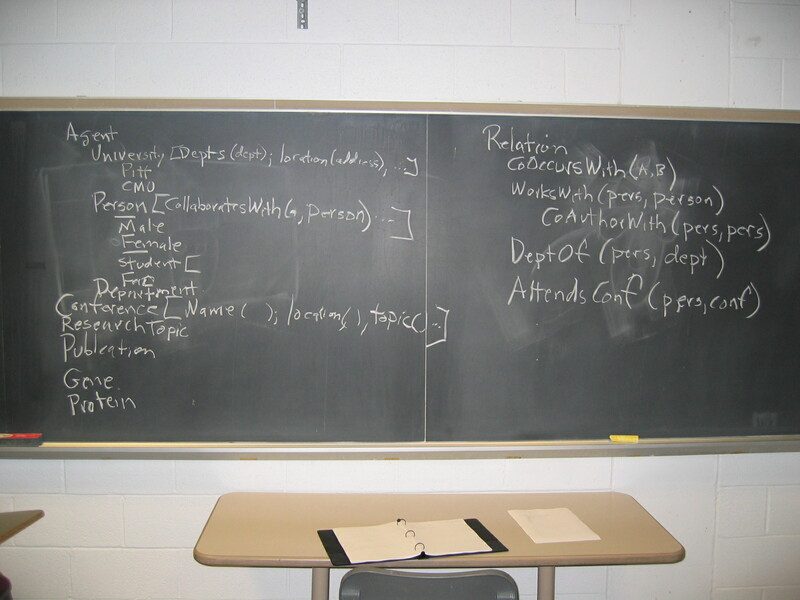 During most class meetings we will spend part of the class studying one or more approaches to semi-supervised learning, and part of the class on design and design reviews of the ReadTheWeb system we're building. The following is a partial outline of topics/assignments/handouts for upcoming class sessions. To be updated as we go. Jan 19. Introduction, Co-Training, and Bootstrap learning from the web (lTom's cotraining slides, Eric's data model slides). Reading: Blum & Mitchell, 1998. Combining labeled and unlabeled data with Co-Training. COLT 1998. Reading: Brin, 1998. Extracting patterns and relations from the World Wide Web, EDBT'98. Assignment out: (1) read the above two papers. (2) Form teams of 2-4 students. Each team will give a 5 min presentation on Jan 26, describing their proposed learning task and semi-supervised approach. Here is some guidance on choosing projects. Student round 1 proposals and discussion. (5 min proposal, 5 min discussion). Assignment out: write a one-paragraph review for each of the other five proposals. Post them to the corresponding KIVA group by tuesday, Jan 31. Assignment out: read paper "Unsupervised Named-Entity Extraction from the Web: An Experimental Study," Etzioni et al., AI Journal, 2005. Come prepared to discuss this paper in detail with the author in class on Feb 9. URNs model: Downey, Etzioni, & Soderland, 2005. 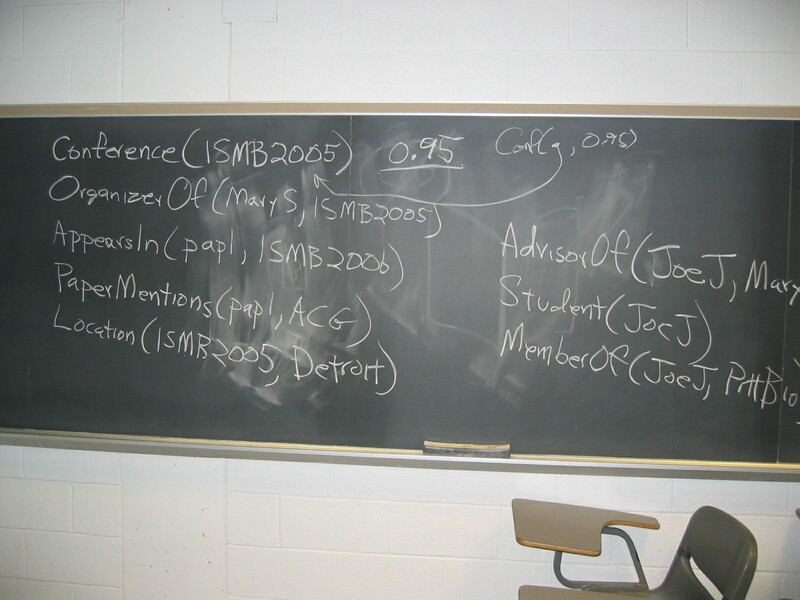 A Probabilistic Model of Redundancy in Information Extraction, IJCAI 2005. Cotraining: Blum & Mitchell, 1998. Combining labeled and unlabeled data with Co-Training. COLT 1998. Discussion of second generation design. March 2. Initial proposals for round 2 projects. Homework out: produce written proposals and post to Kiva by WEDNESDAY March 8.
reading: Charles Sutton and Andrew McCallum, 2005. Composition of Conditional Random Fields for Transfer Learning, in Proceedings of Human Language Technologies / Emprical Methods in Natural Language Processing (HLT/EMNLP) 2005 . March 30. Schedule for projects and integrated RTW system. April 6. We reviewed and discussed the draft APIs posted on Kiva, and reviewed the overall timeline for finishing the course. A summary of action items was captured in a set of PowerPoint slides. Each team will tabulate the steps in their module's operation following the example provided by Andy Schlaikjer, and document those steps in more detail (see slides for more). This file is located at /afs/cs/project/theo-21/www/index.html. Tom Mitchell, January 20, 2006.